Dancing in Malcolm X Park by Elvert Barnes licensed under Creative Commons. This article was first published by the DC Fiscal Policy Institute. The District’s long-term success depends on ensuring that everyone has economic opportunity and the chance to succeed. Yet new income and poverty data from the Census Bureau tell us while many District residents are benefitting from DC’s strong economy, many Black residents are still struggling to make ends meet and are not sharing in our city’s rising prosperity. The District must do more to break down economic barriers faced by people of color and support families in building a secure future for their children. 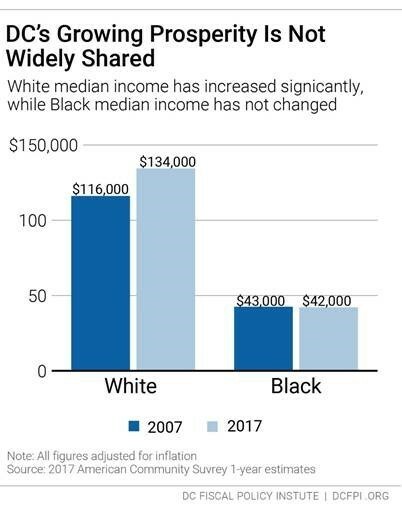 But a closer look shows that DC’s growing prosperity is not evenly shared: while the median income for white households has increased significantly over the last decade, the median income for Black households hasn’t budged. Black median household income in DC– now around $42,000—is less than a third of the white median household income of $134,000. The lack of progress for Black households in a growing economy is a sign that the District is not doing enough to remove barriers to economic opportunity for Black residents, like hiring discrimination, under-funded schools, and insufficient affordable housing. The latest Census statistics also tell us that the share of residents living in poverty has decreased. In 2017 nearly 110,000 residents, or 16.6% of residents, had incomes below $25,100 for a family of four. That means 10,000 fewer residents are living in poverty compared to the year before. 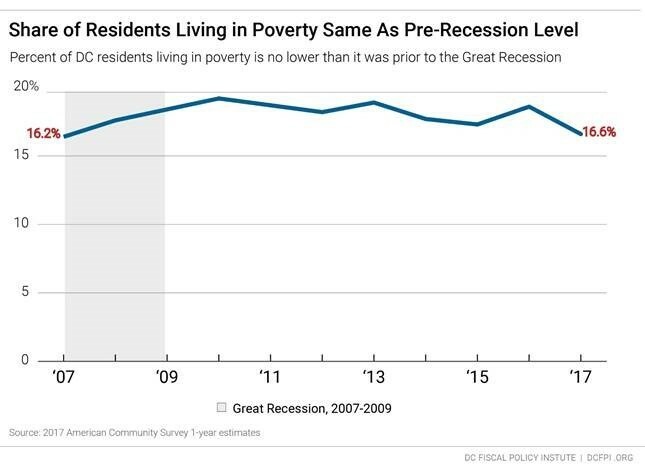 While that’s good news—and likely due to a growing economy and recent increases in DC’s minimum wage—our poverty rate is no lower than it was in 2007, prior to the Great Recession. This means that poverty has come down after rising sharply in the Great Recession, but we haven’t made long-term progress in reducing poverty. And, our youngest residents are among those most likely to be living in poverty, with 26% of DC children growing up in families working hard to make ends meet. The vast majority of children living in poverty are children of color.